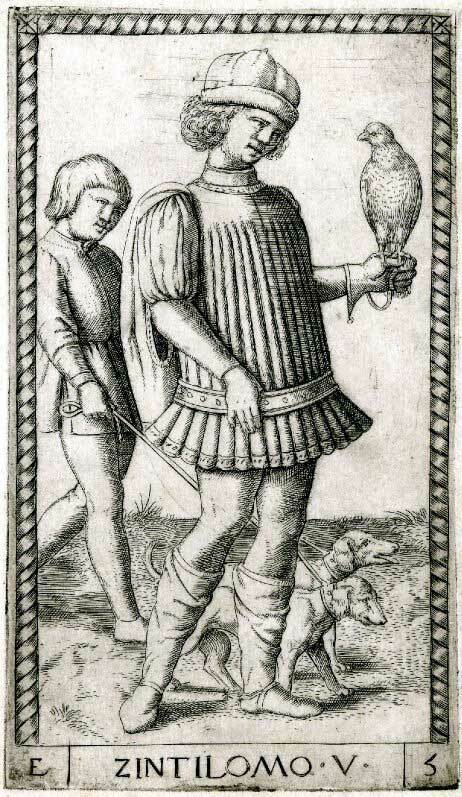 ITALY is said to be the birthplace of the tarot, along with Italian-suited playing cards. 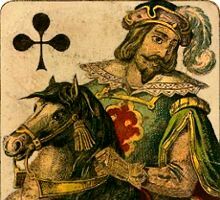 According to playing-card historians tarot was originally a card game invented in the fifteenth century whose principal innovation was the introduction of trumps into card games. The tarot is an augmented deck of playing cards. 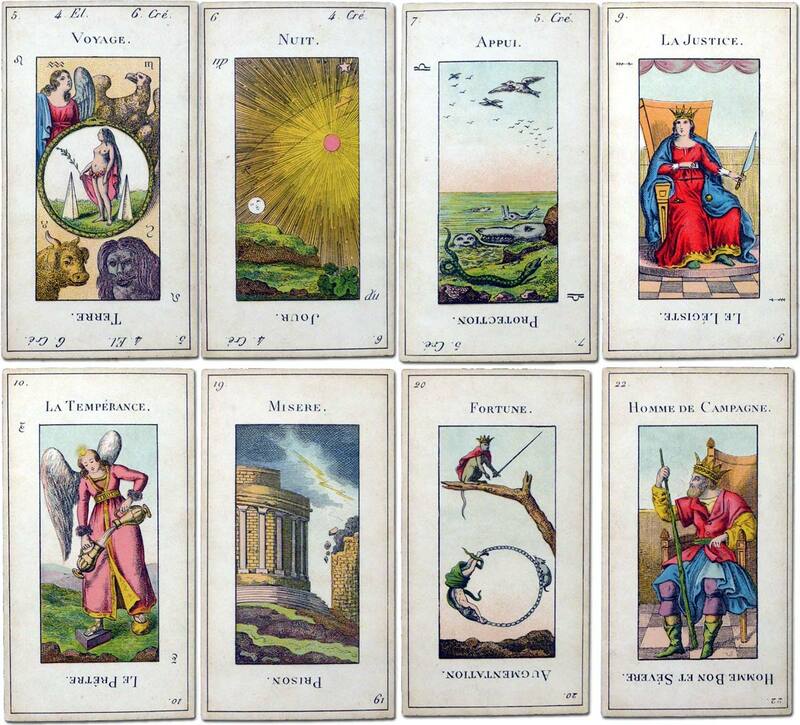 Although the divinatory aspect of tarot didn't became popular until the 18th century, alchemical, astrological and hermetic imagery did appear in some earlier tarocchi decks because it was a part of the imaginary repertoire of the time. It is rewarding to investigate these mysteries for their own sake, but they were not necessarily intended to be part of the original game. 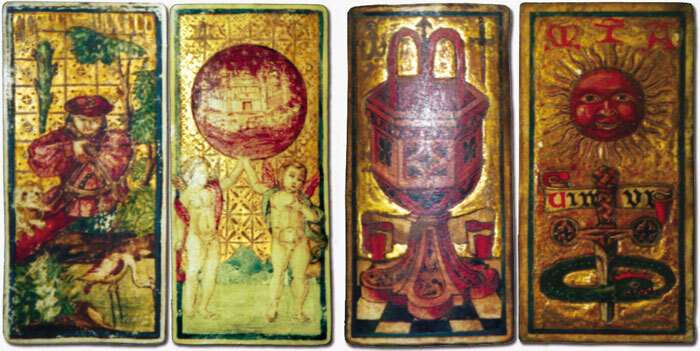 Above: the 4 "Guildhall Library Tarocchi Cards" from the Worshipful Company of Makers of Playing Cards collection of historic playing cards. 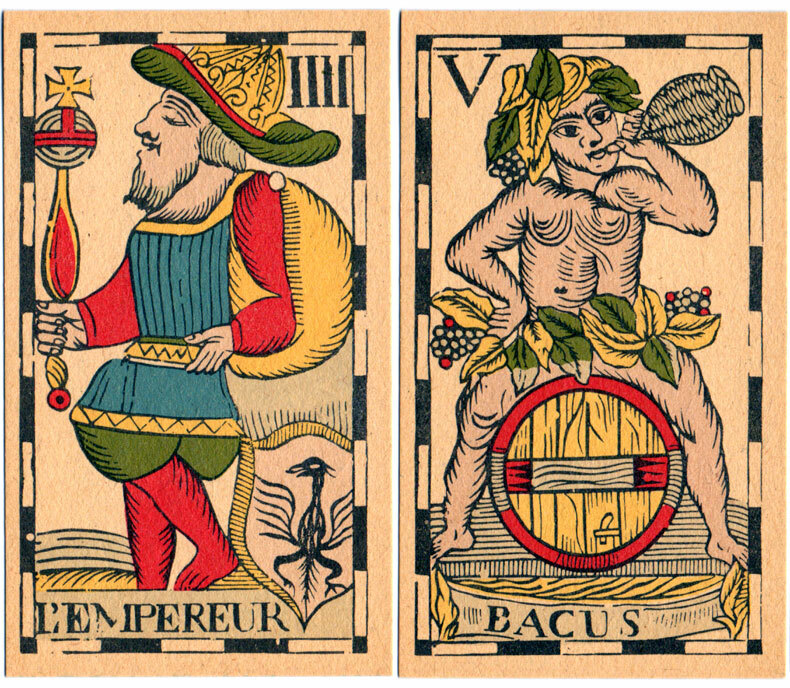 Hand-painted and gilded by an illuminator, these cards are reckoned to be two pairs of cards from two different decks owing to differences in their size. The Guildhall catalogue records both pairs as having been found in an old chest in Seville (Spain). 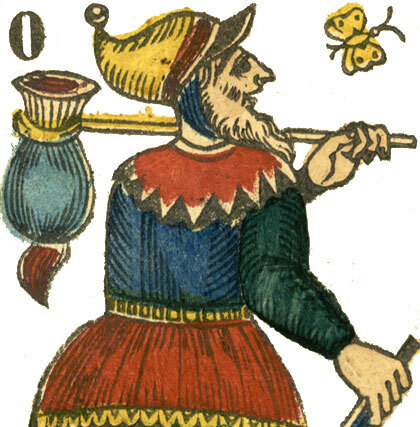 The Page of Batons has a Spanish-type club and is not holding his suit symbol as is common in all known Italian cards. 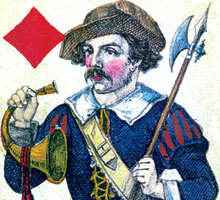 The cards have no titles or numerals, so their sequence or hierarchy was presumably already known by the players. 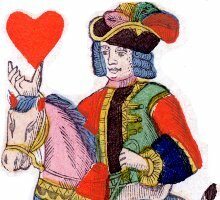 [Images by kind permission of the Worshipful Company of Makers of Playing Cards Collection and the London Metropolitan Archives, City of London Corporation]. 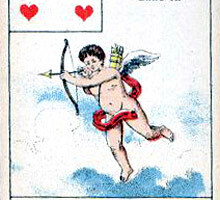 Another similar example are the so-called 'Goldschmidt Cards' (a Google search will find some images. Also see Hoffmann, 1973). 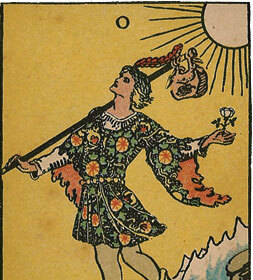 Above: detail from the Cary Collection uncut and uncoloured sheet of tarot cards (housed in the Beinecke Rare Book and Manuscript Library, Yale University in New Haven, Connecticut) probably printed in Milan and possibly dating as early as c.1500. The entire sheet is available for digital download here. 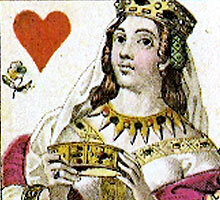 The images are untitled and unnumbered, again suggesting that players must have already known the sequence or hierarchy of trump cards in play from contemporary knowledge. 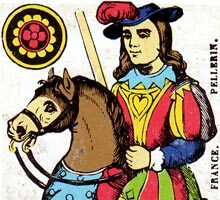 Much of the imagery is recognisable as anticipating the more familiar Tarot de Marseille designs (see below) whilst other features are common to other early Italian decks such as the Visconti-Sforza and D'Este decks. 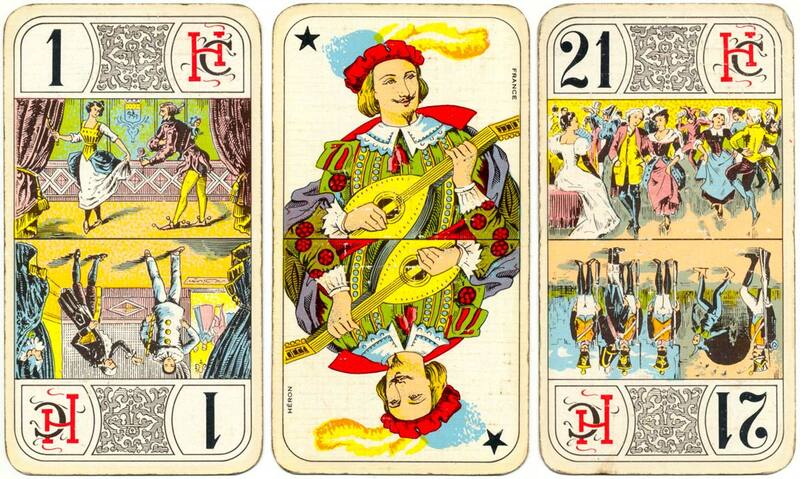 Thus it looks like a prototype or intermediate form of the Tarot de Marseille design. 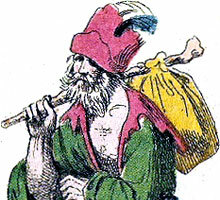 The French word ‘tarot’ derives from the Italian ‘tarocco’. 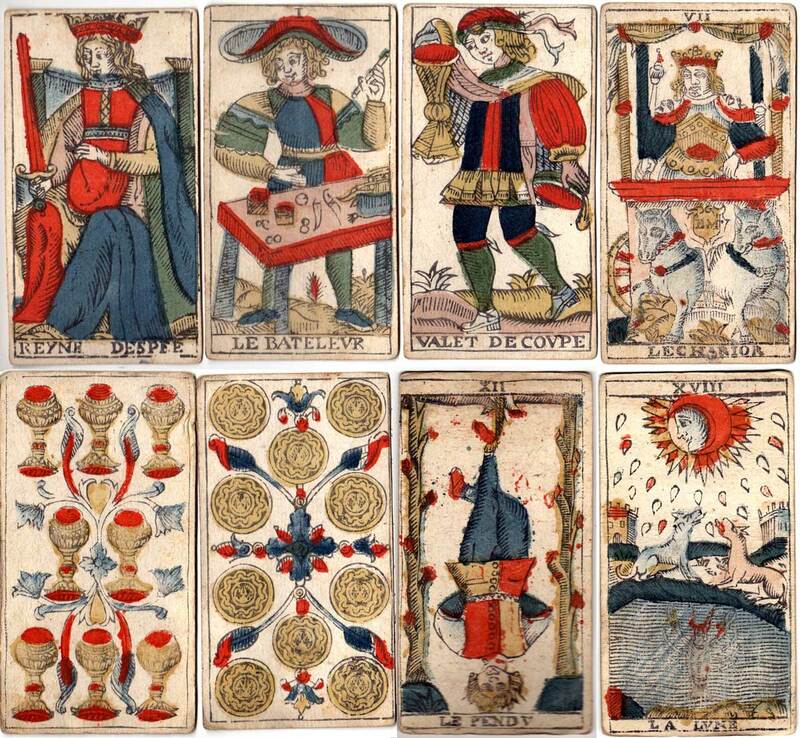 The Tarot de Marseille derives from the Milanese style of tarot, with the names of the court cards and trumps added at the bottom. 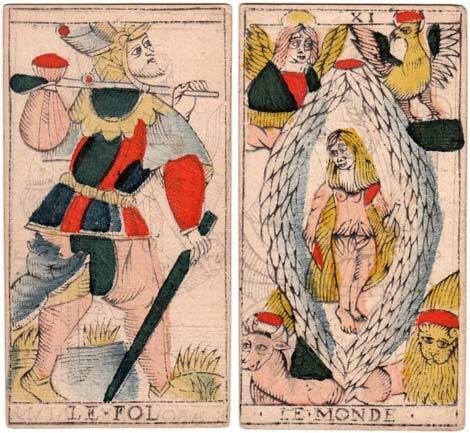 It preserves much of the original iconography of tarot which was corrupted by later alterations and changes. 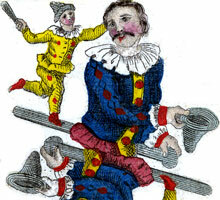 Above: Tarot de Marseille by Jean-Baptiste Madenié, Dijon, early 18th century. The trump cards are named and numbered to designate their value during play. Images courtesy Frederic C. Detwiller. 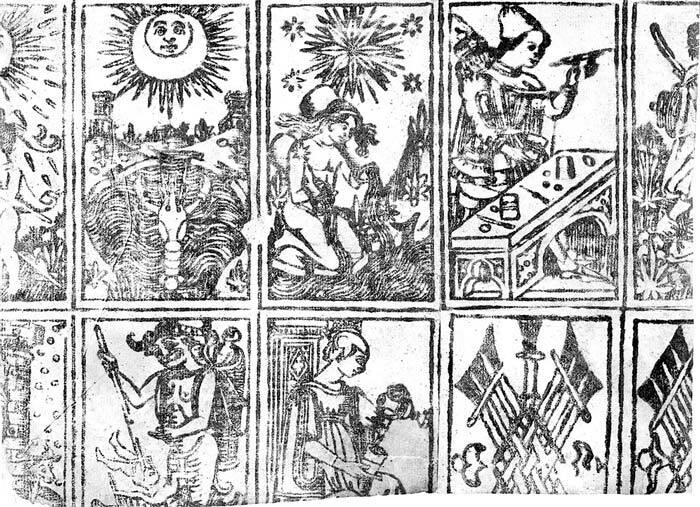 Above: Tarot de Marseille by N. Conver, 1760 but probably a Camoin (Marseilles) edition of c.1870 from the original woodblocks. Stencil colouring. The 16th century had witnessed a renewed interest by scholars in classical history, along with the study of archaeology, philosophy, ancient religions, etc. This was accompanied by the publication of new treatises on all sorts of emerging scientific subjects. The Romantic Movement gave rise during the 17th century to renewed interest in antiquarian topics (stonehenge, druids, etc) and has exercised a strange power over popular imagination ever since. The game spread in Europe from Ferrara, Bologna and Milan towards Germany, Switzerland and France, where the Swiss Tarot and Tarot de Marseille were eventually born. 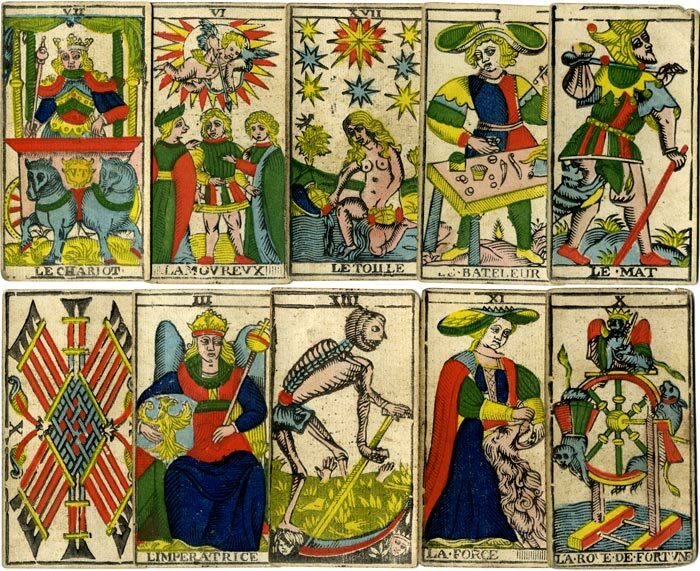 During the eighteenth and nineteenth centuries the Tarot was elaborated by occultists into a medium for esoteric ideas and the prevailing theory of their magical and divinatory origin was developed then. 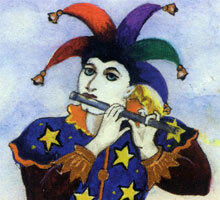 At this point the history of tarot merges with the much older history of esoteric mysteries. 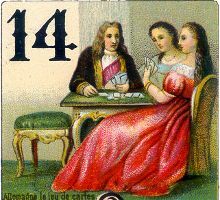 The first pack specifically intended for cartomantic use was that designed by Etteilla and published in 1789. 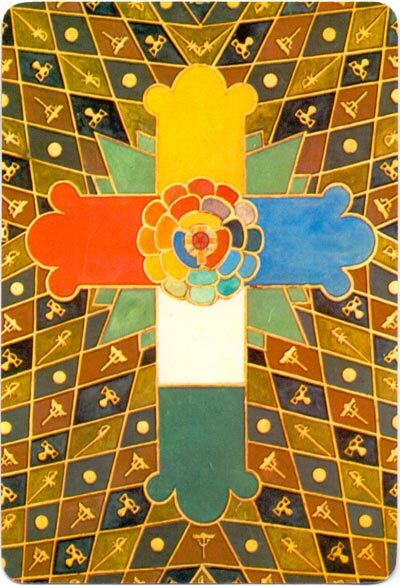 Above: Etteilla tarot published by Grimaud, Paris. 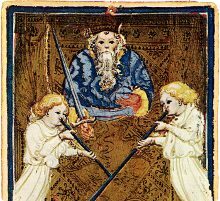 French occultists Court de Gébelin, Eliphas Levi and Eteilla saw correlations between the tarot trumps and ancient mysteries. 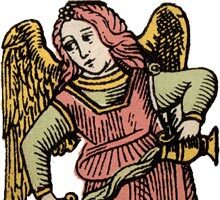 Like French and English Freemasons they wished to sanctify their alternative spirituality with the authority of antiquity. 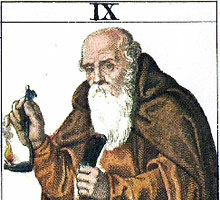 The histories presented by these founders of tarot occultism were produced in good faith at that time, attributing the tarot to the ancient Egyptian Books of Thoth, and the trump images to symbolic frescoes on the walls of Egyptian temples used for instruction during initiation of neophytes, again alluding to a spiritual “journey”. 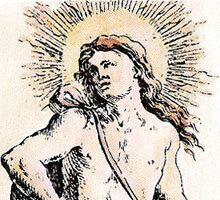 Inspired by these early speculations, modern tarot packs now draw upon the teachings of a tremendous range of traditions, from Western esotericism and alchemy, Buddhism, Sufism and Egyptian initiations, to mystical Christianity, Gnosticism, Neoplatonism, Celtic mythology, Druidism… and so on (suggesting a common unity between them all). 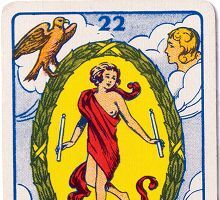 People have mapped whichever belief system or philosophy they fancy onto the tarot deck and then find they can quickly realise and develop an affinity with the symbolic images which become a source of meaning or guidance. 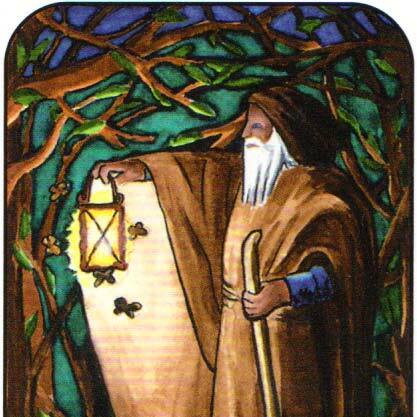 Today's Tarot Studies come under the History of Art, Literature, Humanities and Cultural Studies headings. Many scholarly works are being produced. 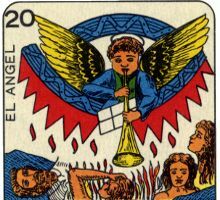 Topics range from historical studies and perspectives to practical interpretations of the cards, their images and symbolism. The universal popularity of tarot reflects a quest to understand our place in the scheme of things as an alternative to religious bureaucracy. The images span from everyday experiences to the larger picture of universal or absolute reality. 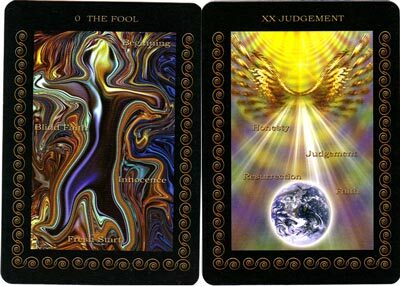 If used imaginatively, tarot symbolism can be a vehicle for new understanding, deeper insight or spiritual clarity. During the 20th century the literature on “esoteric tarot” has grown spectacularly and fantasy is given freedom to create every imaginable type of tarot card, from the “72 names of God” to the Maya Calendar. 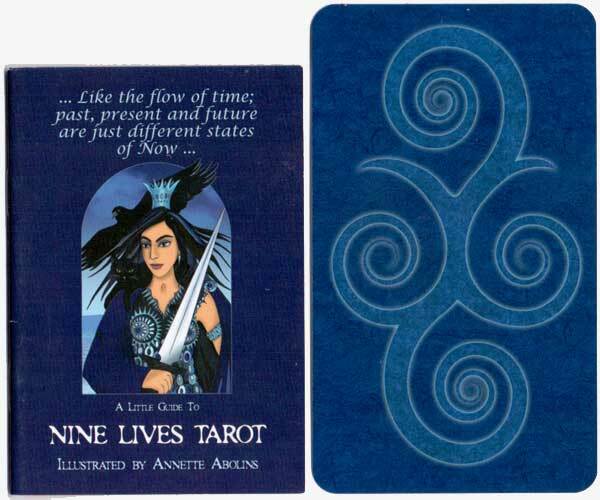 These new tarot decks are usually accompanied by booklets explaining the rationale and meaning of the symbolism chosen in the images. 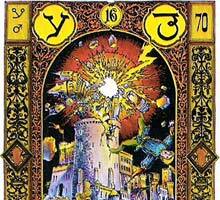 Modern tarot therefore is a recent phenomenon with yearnings to an ancient occult history. During almost 600 years the tarot cards have undergone a transformation from renaissance card game to new age spiritual treasury. Every age gets the tarot that it deserves or desires. Dummett, Michael: A Brief Sketch of the History of Tarot Cards, The Playing-card, Journal of the IPCS, vol.33 no.4, Apr-June 2005.